As we celebrate the fifth birthday of One in Four and reflect on the strange and wonderful journey that brought us here, I’ve been thinking about what causes our colleagues in the wider media to focus on mental health and what we’ve done differently. When we began there were no multi-million pound mental health awareness campaigns, no concerted pushes – backed up with cold hard cash – to shift media attitudes. It is true that there are more personal accounts of mental health difficulty in the media than ever before. This has not been coincidental but part of a long courtship between mental health charities large and small and media producers. This is a movement in the right direction, but, if the media over the last three months were to believed, the entire edifice of mental health and wellbeing is teetering on the brink. Psychologists and psychiatrists are at each others throats. In the background looms the publication of the fifth revision of the Diagnostic and Statistical Manual of Mental Disorders (DSM5), which depending on which column you read may be the end of any scientific basis for mental health treatments, a massive win for pharmaceutical companies, a massive medicalisation of everyday life or, far more sensibly, a book categorising mental health difficulties that we don’t even officially use in England. But these stories set the media alight. They have drama, they have high-stakes, they have personalities duking it out and being rude to each other. As do the stories of high profile celebrities experience of mental health difficulty and tragic events like suicide. Reporting around mental health focuses on flashpoints and controversies, scandals and one-off events. Sometimes mental ill-health is a mental ill-health is a kind of spice added to a story to give it that extra zing. News and current affairs media often has a problem cover stories that unfold over time. They prefer things that explode into view then just as quickly disappear. This is often a terrible format in which to explore the day to day realities of living with a mental health difficulty. Mental health difficulty is still seen as a dramatic event. As any of us who have had rocky periods in our lives know, living in a constant state of crisis is not exciting. For all of the pain it causes, it is often- in the eyes of others at least – profoundly boring. The media is always looking for the unusual, the extreme, the noteworthy. It often only wants to know when things are exceptionally bad or exceptionally good. For most of us, our experiences of mental health difficulty are somewhere in between and so rarely punch through into mass media unless they fit a programme format (If you’re reading BBC Three; you can have Bipolar Wrestling and My Big Fat OCD Wedding) or fit an existing narrative like X overcomes Y or Scandal of Z puts pressure on government ministers. If there is an innovation that we’ve pioneered with One in Four it’s that we’ve focused throughout the life of the magazine on the opposite of drama. One in Four hasn’t been the place for screaming arguments and impassioned editorialising, calling for heads to roll. If anything, One in Four is a hymn to the mundane and the everyday, because the day-to-day business of living life with a mental health difficulty has been something seldom explored and discussed. If there’s one thing I hope we’ve achieved with One in Four is taking others with us on the quest to show that stories of everyday life and everyday struggle are a powerful place for people with mental health difficulties to learn from each other. 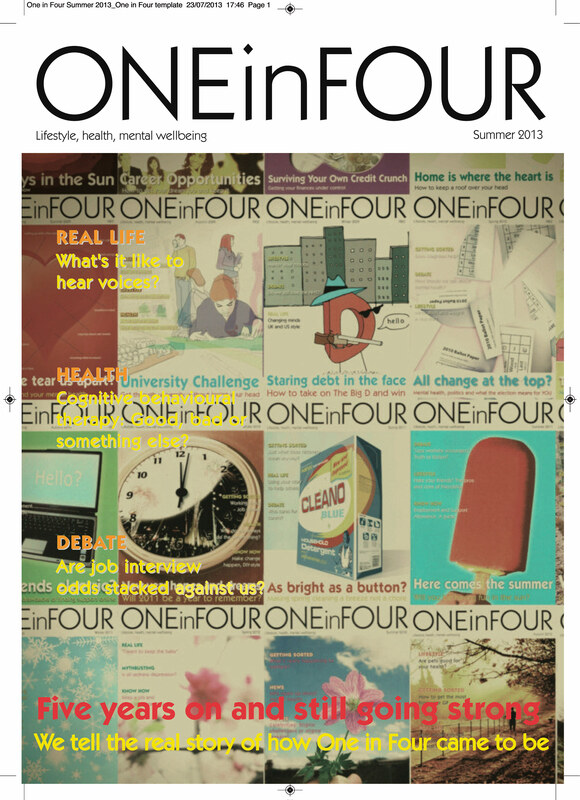 This editorial appears in the Summer 2013 edition of One in Four magazine. 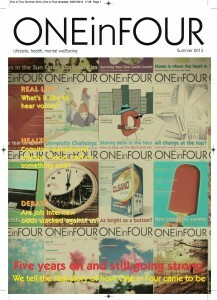 One year subscriptions to ONE in FOUR are £1o.00GBP. Why not subscribe?